Storks isn't the year's best animated film. It's not even a "great" animated film. But it's a very good one, with a very funny script and an emotional heartbeat to boot. Storks is the latest addition to this year's list of animated films that didn't get the audience they deserved in the US, following The Little Prince and Kubo and the Two Strings. The Warner Bros. animated film (that cynics may dismiss as a placeholder while the studio works on their six-dozen Lego Movie sequels) garnered a mild box-office opening and equally tepid reviews from Stateside critics. It's a bit of a puzzle that the film never generated much audience interest in the US, with its all-star voice cast, colourful visuals, and emphasis on cute babies pushed to the forefront in the marketing. But significantly, Storks is actually quite a bit better than some of 2016's big animated hits (namely Kung Fu Panda 3 and The Secret Life of Pets). 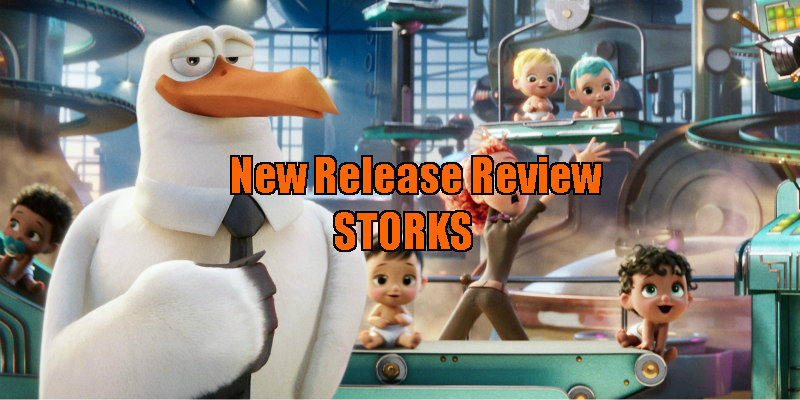 While somewhat derivative at times and thinly scripted at others, Storks is a surprisingly smart comedy, offering steady laughter and solid entertainment for 90 minutes. Storks have delivered babies to eagerly expectant families for centuries. But in the modern age (and with "so many ways to make a baby"), storks have moved on to form Cornerstore, a worldwide shipping business. And rising employee, Junior, is looking to inherit the position of boss in just a few days. His only task to achieve this status is to fire the only human worker in the factory; an 18 year-old orphan named Tulip. But due to a wacky series of mistakes, Junior comes across a baby that needs to be delivered, and can't do the job without the help of Tulip. So the two escape the factory in Tulip's secret plane and fly away to unite the infant with her family. Inevitably, Storks falls short of Phil Lord and Christopher Miller's joyously infectious The Lego Movie. However, the directors - Nicholas Stoller and Doug Sweetland - put in a strong effort, and at the film's peak, that level of creativity and hilarity is palpable. 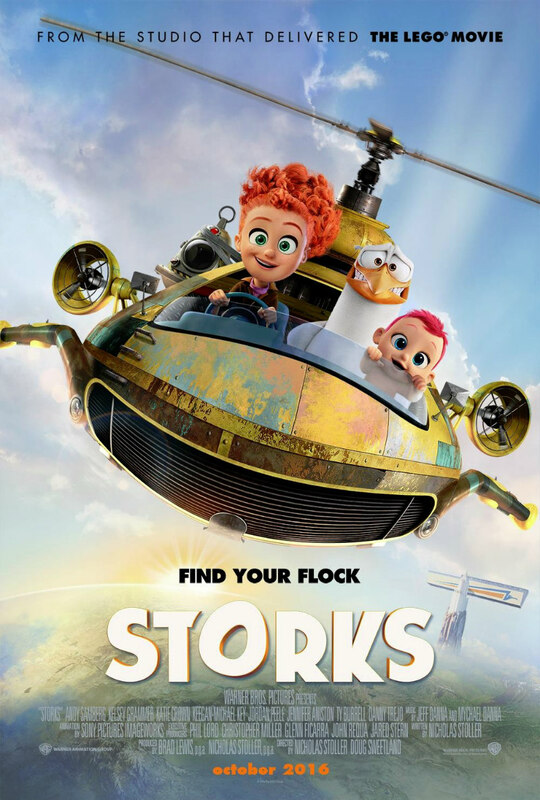 Certainly Storks manages to duplicate The Lego Movie's rapid-fire pacing in its gags, though the hit ratio is lower - about 75% of the jokes land, though due to said gag-frequency, there's really not enough time to grimace at a weak stab at comedy. And truth be told, there are individual sequences that stand as some of the funniest to grace an animated film in recent years (an inventive chase involving wolves and an unconventional fight with flightless birds). Furthermore, Stoller does humour in that beautiful Pixar way in which adults and children will laugh at the same jokes, rather than targeting children with slapstick and adults with pop culture references. That being said, a couple bits do sneak in that will specifically appeal to parents who have understood the struggles of raising children in their infant stage. But aside from its frequently successful humour, what really sets Storks apart from many of the other animated films on the market is its surprisingly large heart. The themes of family here - touchingly handled both with Tulip's desire to meet her family, and with a boy named Nate wishing for a younger brother (or at least the attention of his workaholic parents) - are handled with unexpected tactfulness and even grace (really). Along with Finding Dory and Kubo and the Two Strings, Storks uses families to tug at the heartstrings, and it truly works. Andy Samberg and Katie Crown share genuine chemistry with each other as Junior and Tulip respectively. While most animated films record actors' dialogue apart from the rest of the cast, it wouldn't be surprising to learn that Samberg and Crown performed together. Anton Starkman is excellent as Nate Gardner, balancing humour and heart. The rest of the cast is very solid, featuring names like Kelsey Grammer, Keegan-Michael Key, Jordan Peele, Jennifer Aniston, Ty Burrell, and Danny Trejo. Stephen Kramer Glickman is very funny as Pigeon Toady, but his Donald Trump-inspired character design is a little odd, considering the character itself doesn't really have anything to say about its source of inspiration. When speaking of animated birds delivering babies, it's hard not to think of Dumbo. And when watching Storks, audiences may find themselves recalling Monsters Inc., Ice Age, and Arthur Christmas (that is, if audiences had actually bothered watching the underrated Aardman gem). The buddy-comedy plot, as well as the end-of-second-act-character-split-contrivance may further annoy attentive audience members. But Storks has more than enough clever ideas of its own to compensate for its occasional familiarity. Note: Storks is preceded by a Lego Ninjago-themed short entitled The Master that's actually very funny and visually amusing. It bodes well for the upcoming Ninjago feature film, due in theatres next year. Storks is in cinemas October 14th.